Published: Feb. 2, 2014 at 09:54 p.m.
EAST RUTHERFORD, N.J. -- The Denver Broncos' offense set all the regular-season records. 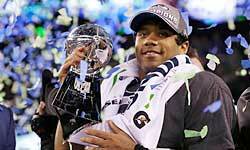 But the Seattle Seahawks' defense will be the one remembered as an all-time great. "We're not sleeping tonight," an elated Carroll told the media. "We're staying up all night because this party's gonna get started as soon as you guys let me go." For so long, we thought the weather would be a factor in the first outdoor Super Bowl in the Northeast. Peyton Manning and the Broncos got perfect conditions -- it was 49 degrees at kickoff -- but the worst possible opponent. We're mentioning so many names because this Seahawks' defense is about more than just the star players and the Legion of Boom secondary. It's a true team that is excellent at all the little things. They hit. They don't allow yards after the catch. And they force game-changing turnovers, like Smith's 69-yard pick six. The Seahawks' defense made Manning and company look like a collection of also-rans. Manning was forced to move in pocket on nearly every throw. Denver's running game was stymied. Every first down was a struggle. Russell Wilson was terrific on third downs and did his part, but the Seahawks' offense was practically an afterthought for much of the game (like much of the season). The score was 29-0 after Percy Harvin returned a kickoff for a touchdown to start the second half. At that point in the game, the Seahawks' offense had ust 13 points. And seven of those points came on a short field after a turnover! It was almost hard to believe what we were watching Sunday night. The Broncos' offense, the picture of efficiency all season, looked completely overwhelmed. They weren't ready for the moment; Seattle was. This was the Seahawks' time. This team, constructed from the ground up, built toward this game for the last four seasons. Now, it will be mentioned as one of the greatest defenses in NFL history.